Imarku's Serrated Bread Knife is extremely versatile and great for slicing everything big and small, from bread loaves, sandwiches, and cakes to tomatoes, watermelons and pineapples, and easily-bruised fruits and vegetables. 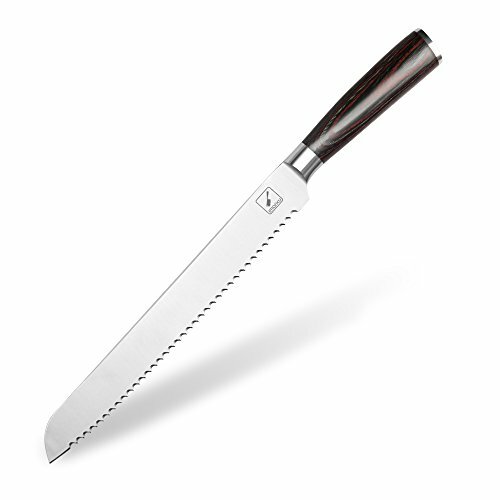 The premium serrated German stainless steel is long-lasting, rust-resistant, stays sharp, and is a perfect gift for moms, cooking enthusiasts, and culinary professionals! - Ultra-sharp, wear-resistant German stainless steel blade with hand-polished satin finish. - 10" blade length ensures there's no challenge too large and is great for cutting even large fruits and cakes. - Ergonomic pakkawood handle shaped for maximum comfort, grip and maneuverability. - Easy cleaning and low maintenance. Imarku offers a lifetime guarantee against defects in materials and workmanship.